Due to the problems with existing vacuum chamber sealers, this created a significant gap in the market which is why VAC-VIDA set about creating a new vacuum chamber sealer. The approach involved designing a vacuum chamber machine from the ground up in order to address the problems with existing machines. The end result of this long journey has been the creation of the VAC-VIDA VS301. So how exactly does the VAC-VIDA VS301 differ in these areas? 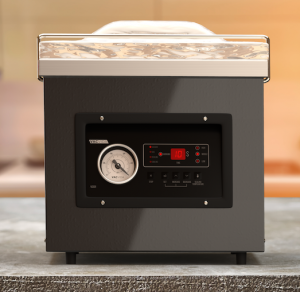 There is no way around it, a vacuum chamber sealer is a large item and it will take up a noticeable amount of room in even the largest of home or restaurant kitchens. So that you can be proud to own of these machines, the VAC-VIDA VS301 uses a premium black powder coated stainless steel to give the exterior a sleek look. Furthermore, the VS301 control panel is not only extremely easy to use, it is also designed to be a very attractive and simple. A vacuum chamber sealer is a significant purchase for any individual or restaurant. We at VAC-VIDA are fully appreciative of this and understand that ongoing customer support is essential. That is why should you have any questions or issues with the product, our customer support team will do our upmost to resolve these for you. Furthermore, the VS301 comes with a 1 year guarantee so you can buy the VS301 totally risk free with this guarantee behind your purchase. The VS301 has been thoroughly stress tested and the oil pump is one of the most reliable on the market. In many of the public reviews of the VS301, the machine has been likened to a ‘tank’ which we believe perfectly reflects the strength and reliability of the machine. Hello and welcome to SO-VIDA.